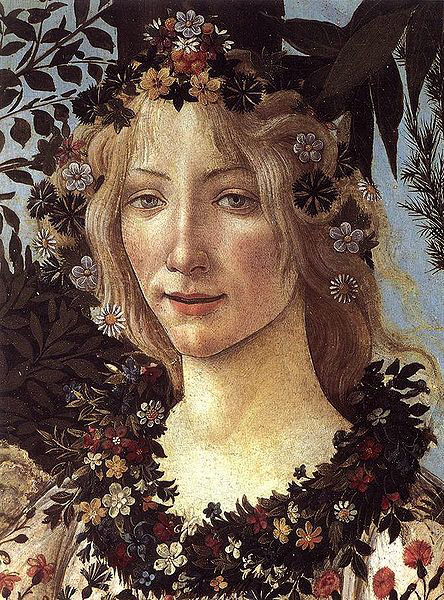 Primavera, the Italian word for springtime, is also the name of Botticelli’s famous painting. I was privileged to see the original in the Uffizi Gallery in Florence, Italy, and stood before it for hours, entranced by its beauty. There are over 500 identified plant species depicted in the painting, including 190 different flowers. As I write this, the earth shifts into the vernal equinox, the time when there is an equal number of hours of light and dark all over the earth, and the official start of spring for the northern hemisphere. I’ve been dreaming of light in dark places lately, even of singing of light in those places. Without light, we cannot see color and it is color that is promised by the arrival of spring. 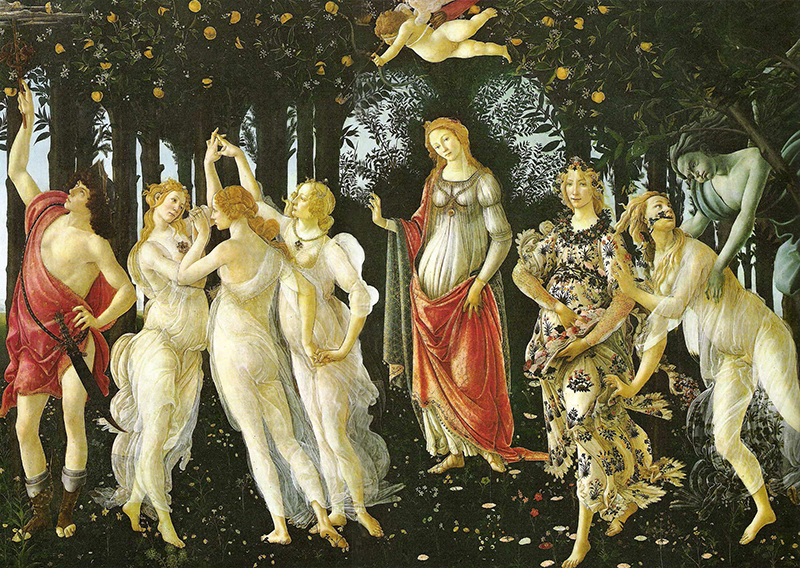 As in Botticelli’s depiction of Flora scattering flowers on the earth, the vernal equinox signals a shift in the turning of the earth to more light and new growth. Happy springtime! Images of Primavera courtesy of Wikimedia Commons. This entry was posted in Flowers, Nature and tagged Botticelli, equinox, light, primavera, spring, spring equinox, The Four Elements: Light, vernal equinox by composerinthegarden. Bookmark the permalink. The title of this post and the content instantly made me think of this wonderful piece I once played. The composer, Piazzolla, wrote his own version of Vivaldi’s “Four Seasons” – my favorite movement is Primavera. It would appear that the word is an inspiration to more than just painters! Bottticelli is one of my favorite artists! I am so jealous that you got to see his work “in the flesh”! Wonderful post! That’s a great video of it – when I played it we had the fun experience of playing the quintet version! Much more percussive, and of course, louder! I also happen to be half Chilean and it’s because of that I was also introduced to Piazzolla’s work! What a coincidence! Well, I needed this post today. Thank you, Lynn. I woke up to my world covered with snow. The good news is that I’m retired now and didn’t have to go anywhere but the bad news is I’m craving spring and color! So your offering helped. Thank you, thank you. P.S. Your voice is really gorgeous! Many thanks, Eleanor, glad to hear that this brightened your snowy day. We still have a few inches of snow on the ground and it has just changed from rain to snow again as I got home from work. I fear that winter is still with us for a few more days at least 😦 I am hoping by Easter break that it warms up and dries up and I can get in the garden. I’m still counting on March going out like a lamb. endless array of hidden treats. I still remember your christmas song . . .
coincedence that I chose to do a post on tiny micro flowers. Rastelly, I think you are so right about that! I remember standing in awe of this painting, which is over 10′ wide, trying to absorb all of the details yet look at the bigger picture. Not something I will ever forget. Glad you enjoyed the video. Hooray for the equinox! Nice to hear The Four Elements again. Thank you. Thank you Chris; I’m hoping to record the other two later this spring. Lovely. I sing along and add a third-part harmony. Lovely post to honor the day! We’ve had Spring for weeks now it is cold and wet so it must be fall again. So Confusing! My calendar and you say it is Spring so I believe it! Lovely music to start the New season. Ah, well, Carol, there is the calendar and there is the weather 🙂 The equinox is about “equal light” anyway – I’m hoping the Weather of Spring arrives soon! Quite outstanding. These images are perfect for the music. That painting is remarkable. I would love to see the original, as you have done. I love that idea, Colonialist! I tried but couldn’t find an actual listing of the plants – that would be a great resource! Here’s a link to the Wikipedia article about the painting. Glad you liked the music too. I did indeed. I really envy you your musician resources! I would rather like a tame live orchestra and choir constantly at my disposal. Always nice to see that video and hear that song (“Light”) again, Lynn. Ah – Italia. I was also privileged to go to the Uffizi gallery in Florence. But, I had no idea the details behind the Primavera. Next time I’m there, I shall certainly do my research so I can enjoy every bit of it and Boticelli’s other paintings! Paula, if you click on the link in the post, you can read a lot of great background info on the painting; the Uffizi has a great website. I would love to go back again to that museum in particular – one of my favorites! Blessed newness and greenness: may all be shot with light and bid growth, Lynn. Your gifts are so amazing; I cannot wait–but will, enjoying the anticipation–to see what will be born this year! Happy spring! Thanks, Kitty; it doesn’t really feel like spring here except the sun came out and lived up to its hype 🙂 Now for some warmth and growth! Your music on the light snow but a bit of sun we have here, was just the perfect start of Spring! Happy to start spring well for you, Diversifolius! Glad to know that there is another Botticelli fan out there. Happy spring! Fitting painting, song, and images for the day … and it can only get warmer! … and thanks for the reminder of your original composition. Happy spring to you too, Vlad! Did you ever get the snow you wanted?